Even on my customary pacific loop rides I’m in search of something different and new to see or to learn or to capture with my camera. The pacific loop has a lot to offer: I can use alternate roads, for example, or take side tours. Sometimes it is the season changes, how the vegetation changes and what the farmers are doing at every point in time. It can be a different color on the ocean, the wind and the waves or the tide. There is the different weather patterns from valley to coast. 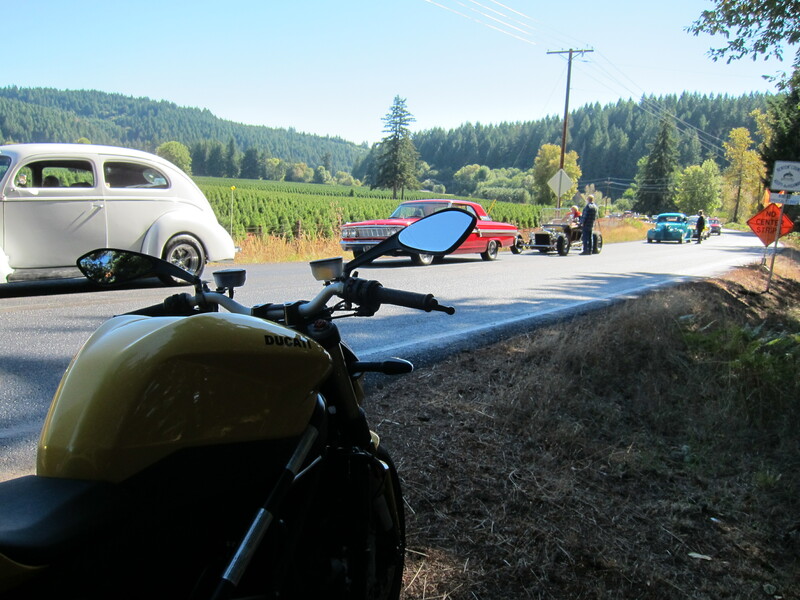 And there is the riding of course, the motorcycle and its workings, those special curves that I already know well. There is always something interesting to see and experience. It is Sunday. The plan is the ocean loop. 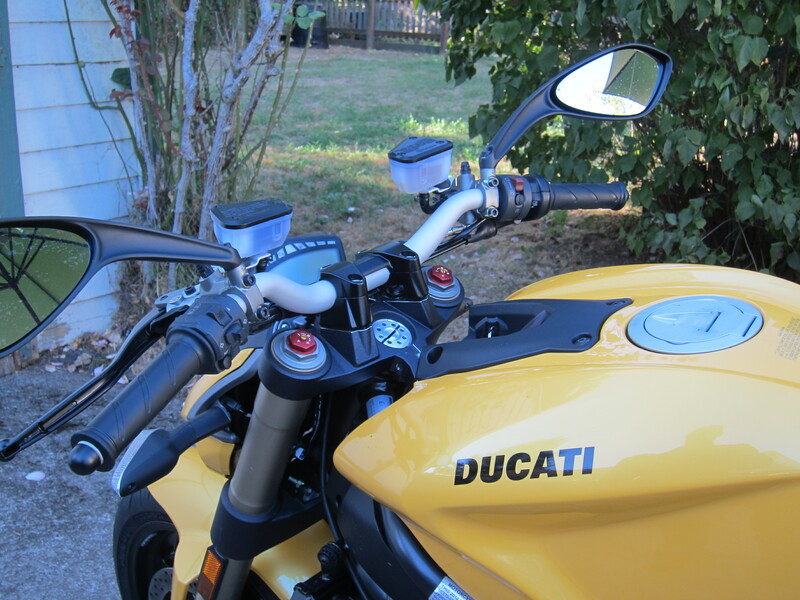 The bike is the Ducati. The sky is clear blue. What will I find on today’s ride? The temperature at the start of the ride, just before 10:00am, was a perfect 62 degrees in Eugene. It would probably warm up as the day progressed, but it could as well be even cooler by the ocean. A full tank of gas and let’s see what is out there. I was curious about the state of the vineyards as fall approaches, so my first stop was at a couple of vineyards in Benton county. 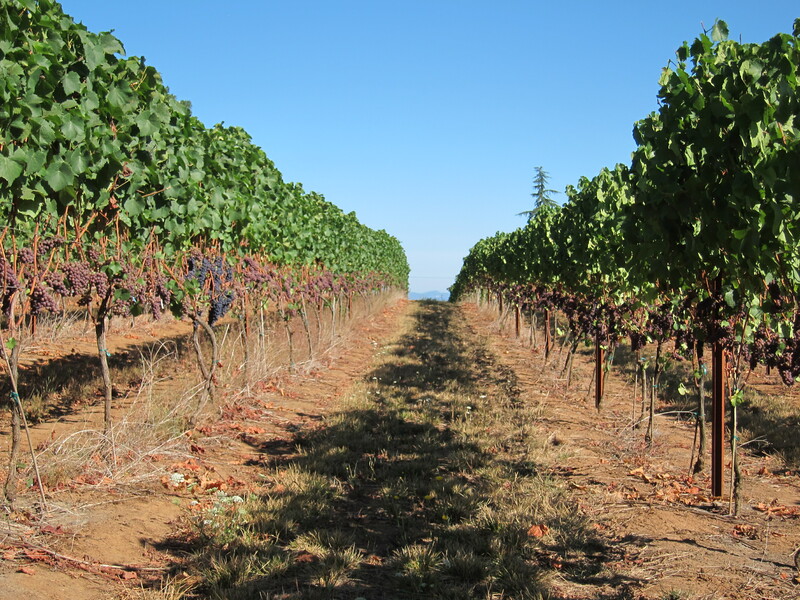 Oregon is the fourth state in terms of wine production in the United States. California is a massive wine producer, taking care of 90% of the American wine production, so we need to take care of that when talking about wine production here. New York and Washington each produce between 3 and 4% of the total American production. Oregon still crawls on wine production, approaching 1% (these data are from the 2009 season, according to a 2010 report of the Department of the Treasury, Alcohol and Tobacco Tax and Trade Bureau). 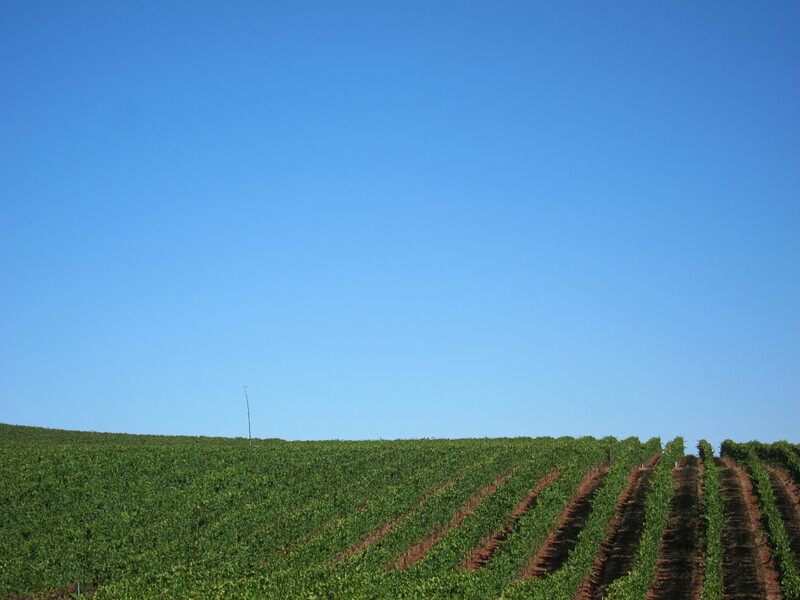 According to industry sources, Oregon is an established leader in sustainable viticulture, committed to sustainable winegrowing and earth-friendly practices. Almost one-third of Oregon’s vineyards are LIVE Certified Sustainable, Certified Organic or Demeter Certified Biodynamic®. Currently there are 20 participating wineries and 2 million certified bottles. 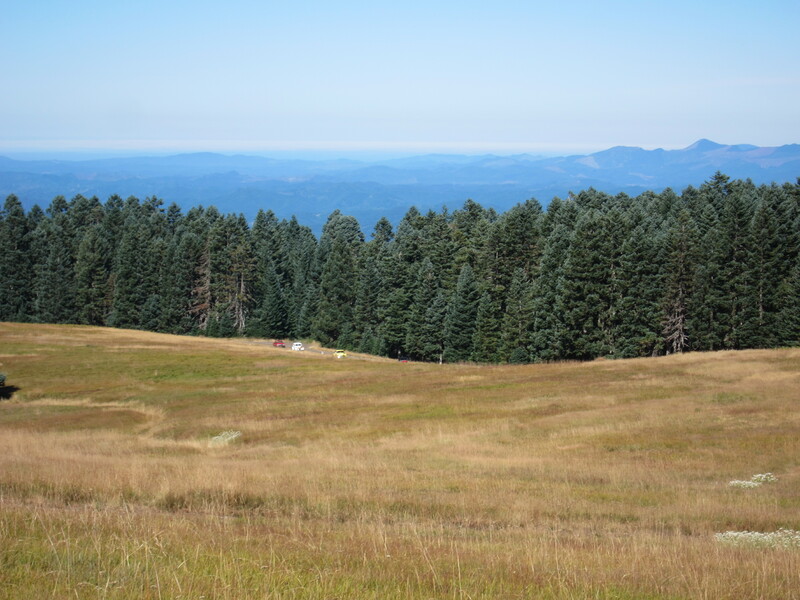 Oregon has 16 viticultural areas, and the Willamette Valley is the largest of these areas in the state. This area’s mild temperatures makes it ideal for cool climates varieties, the most common in the Willamette valley area are Pinot noir, Pinot gris, Chardonnay and Riesling. In a few more weeks these grapes will be ready for the harvest. It seems to me that 2012 will be a good year for Oregon wine. 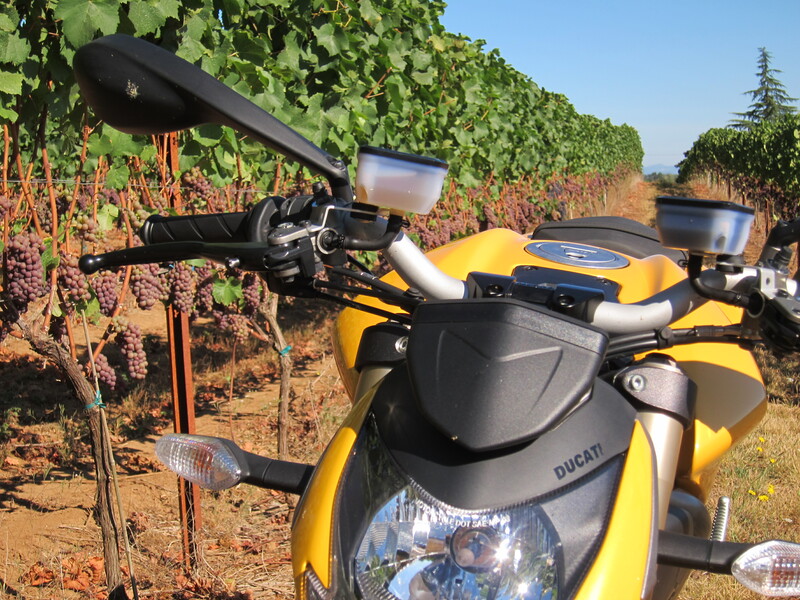 If it is a good season for riding, chances are it is a good season for the grapes as well, so it could potentially be a good year for wine making. Now we enter a critical period for the grape development, just before the harvest, where it is most delicate and on a faster curve in acquiring the desired characteristics, sugar content being one of them, for a great future wine. Let’s hope the weather will collaborate during this year’s vendemmia to confirm a great 2012 season for wine makers. When in college I took an enology class (Enology: the study of wine and the making of wine). Unfortunately I don’t remember much from those classes. That course was very competitive among the optional courses offered; it was an easy “A” and the lab classes involved sampling wines, and it also included a tour of the local wineries (that was in Brazil, by the way). Have you ever drank wine out of a beaker or a test tube? I did very well on those “tests.” That part of the class I remember. Well, it was not quite that way. I learned something from that course, especially an appreciation to the complexities in the process of making a good wine. 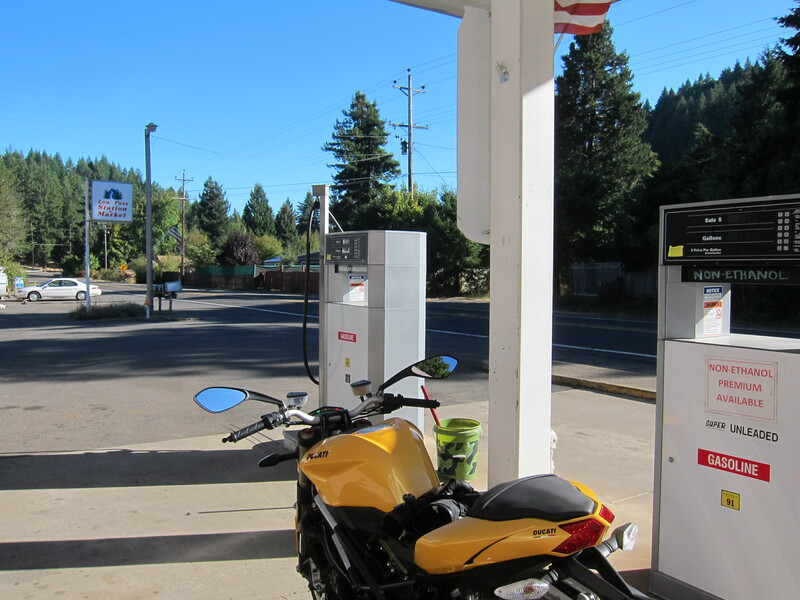 Continuing north I made a fuel stop in Philomath, only because this gas station sells non-ethanol premium fuel. 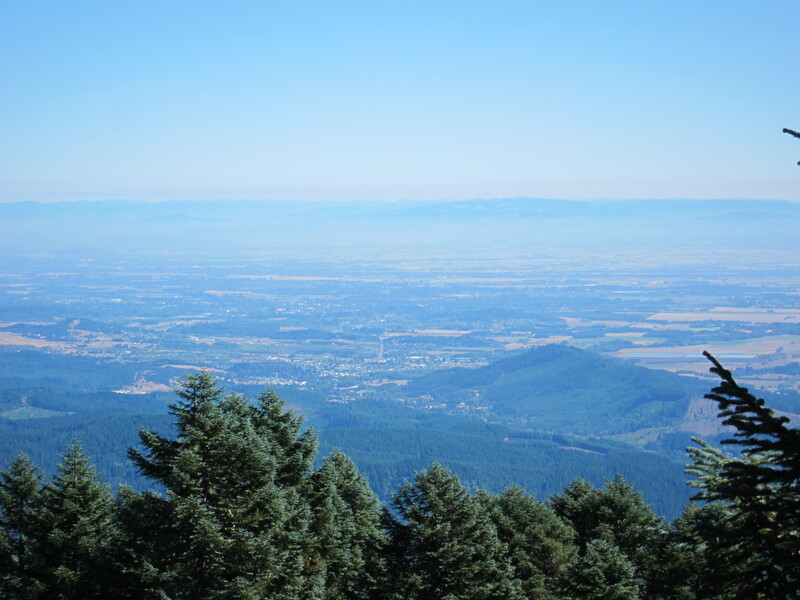 Since it was such a clear day, I thought it might be a good day to check the views from the top of Mary’s Peak. 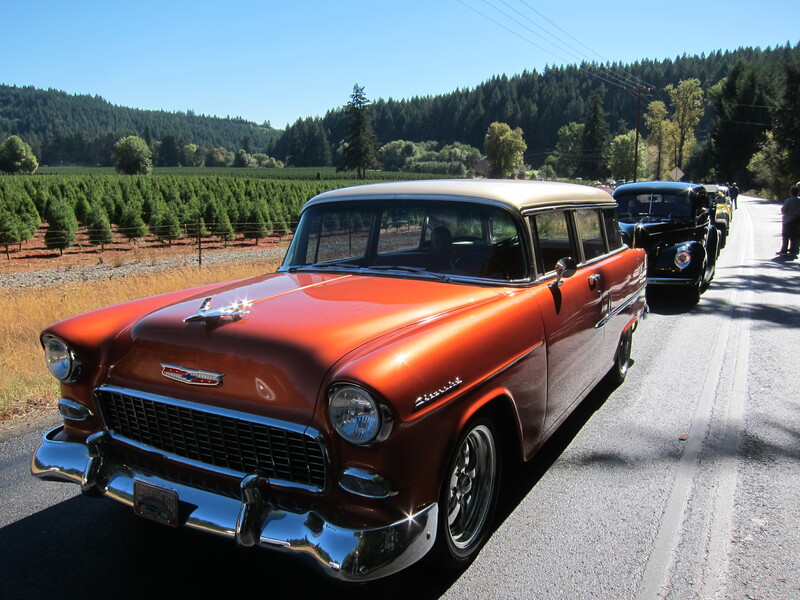 I continued on 34 towards Mary’s Peak when I sighted a row of old, classic cars parked on a side road to the left. I turned around and checked them up close. They told me they were waiting for the group was gathering there and once complete they would drive up Mary’s Peak for a lunch break. 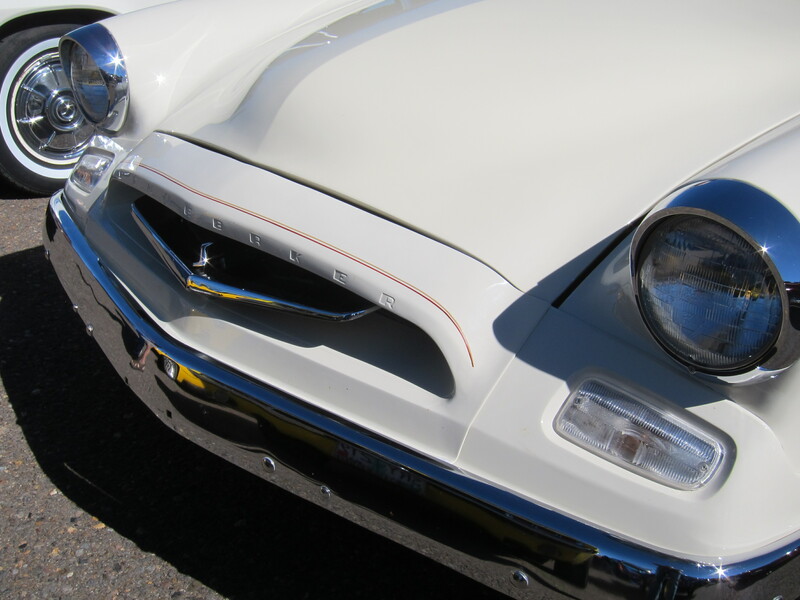 When is it that an old car becomes a classic? Anyway, I wanted to get on the road before they did, otherwise it would be a slow procession to the top. I gave them a “see you later” and got on my way. 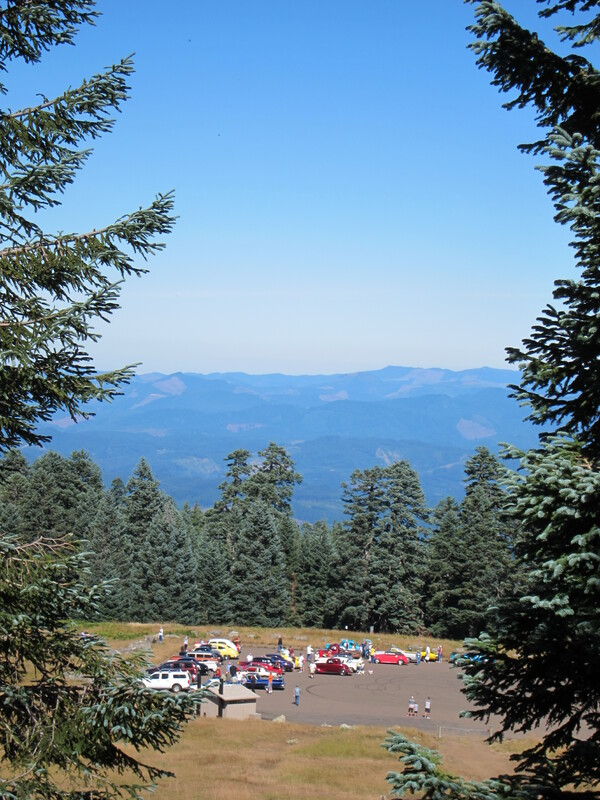 If the timing worked well for me I would have time to get to the end of the road on Mary’s Peak, park the bike, hike up to the top of the mountain and hike down, and still have time to see the cars before they would start driving down the mountain. On my way to the top I realized third time was a charm. The views were the best yet today on this which is my third attempt. I was just starting my hike up to the top when I heard far away the humble of the cars. Sounds travel well in the mountain. I turned around and saw the cars as they approached the parking area. 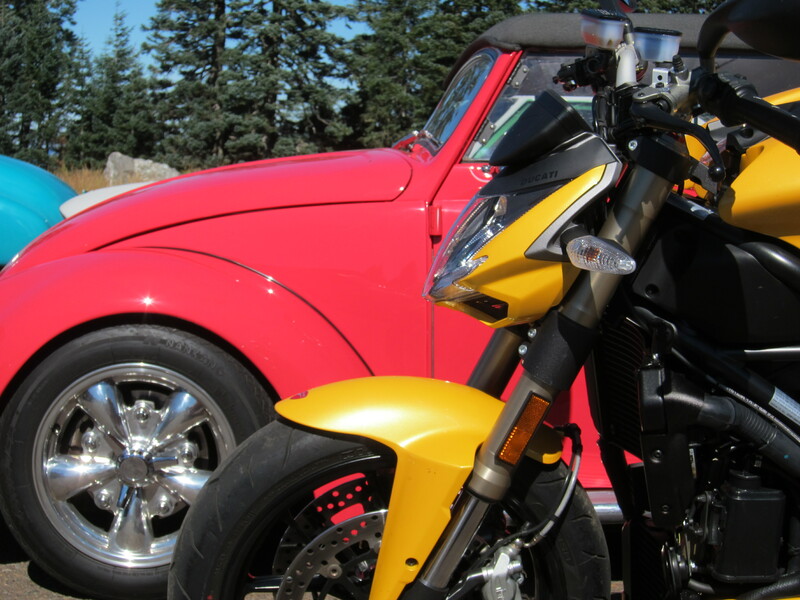 The motor sounds increased as they gathered in the parking area and parked. Soon motors were shutting down and I was hearing doors opening and closing, and the joyful voices of the people happy to have arrived at a beautiful destination in such a beautiful day. It was interesting to hear these sounds and quite a sight to see the parking area taken by these cars all of a sudden. I got back to my hike. The views were fantastic today. But I have a feeling the views can even be better, but I should have to leave something for future aspirations, right? 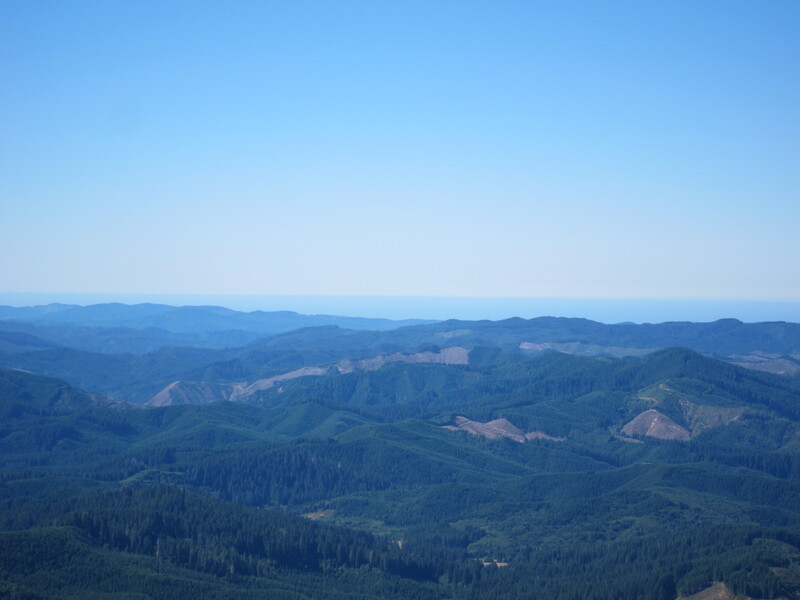 Here is a view of the Willamette valley, a south east view of it. The Cascades on the background. And looking west there is the ocean on the horizon. It looks like low clouds are there. On a clear day on the coast the line between sky and ocean should be more defined. As I reached the top I met a group of tourists from Ohio of all places. We exchanged our Ohio histories and had a brief conversation about the coincidence. I’m so far from Ohio in terms of time, it feels, although I only left it seven years ago. 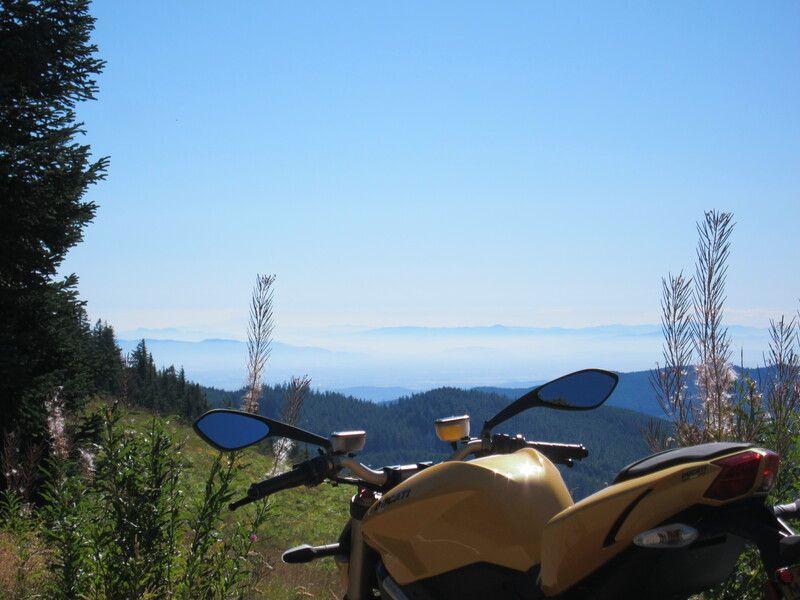 Time to go down, another view of the Willamette Valley, now looking north east. The Ducati decided to check it up close. 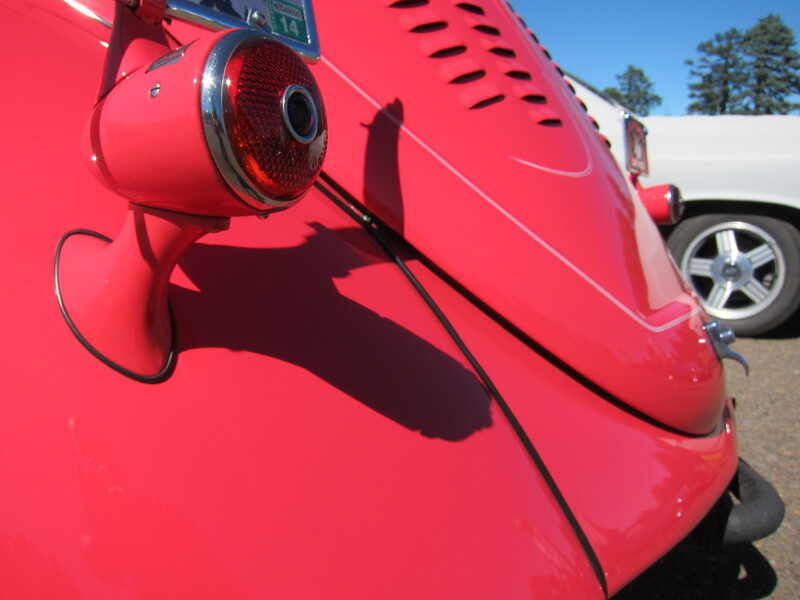 A few details of the work on this VW. 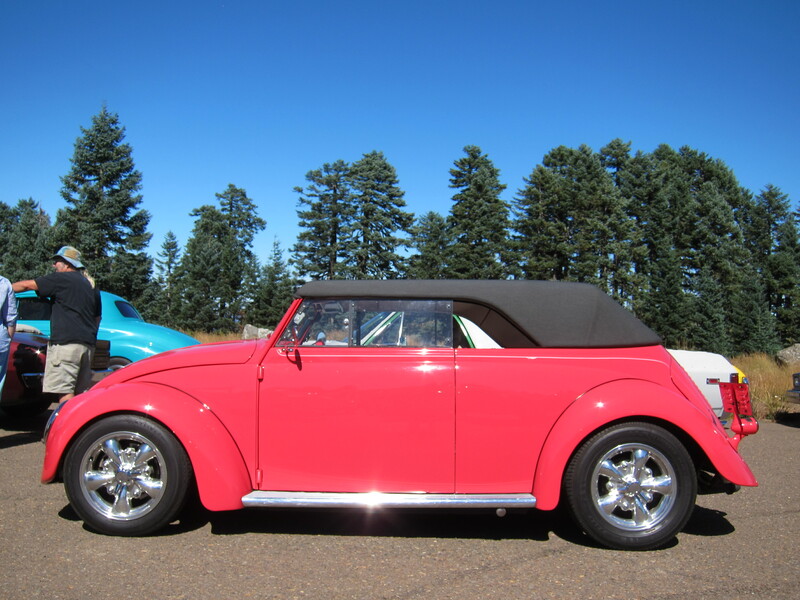 Not an original color, and not quite a manly color, not that there is something wrong with it. But it actually works and is not a bad result in terms of art. I liked it. And the interior. Someone put some effort in building this car. Time to move on. I went down to the coast and confirmed the clouds I saw from the top. 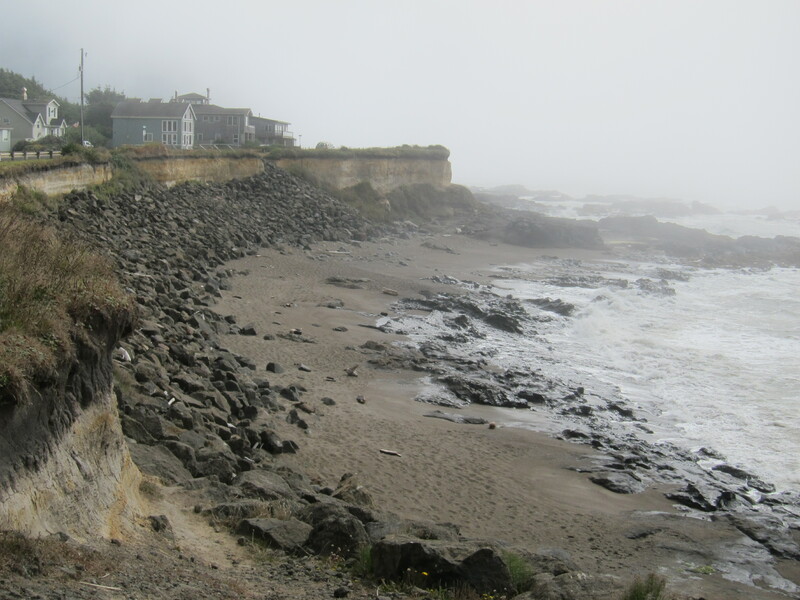 The relentless ocean carves its way on the Oregon coast. The bike kept getting on my way. 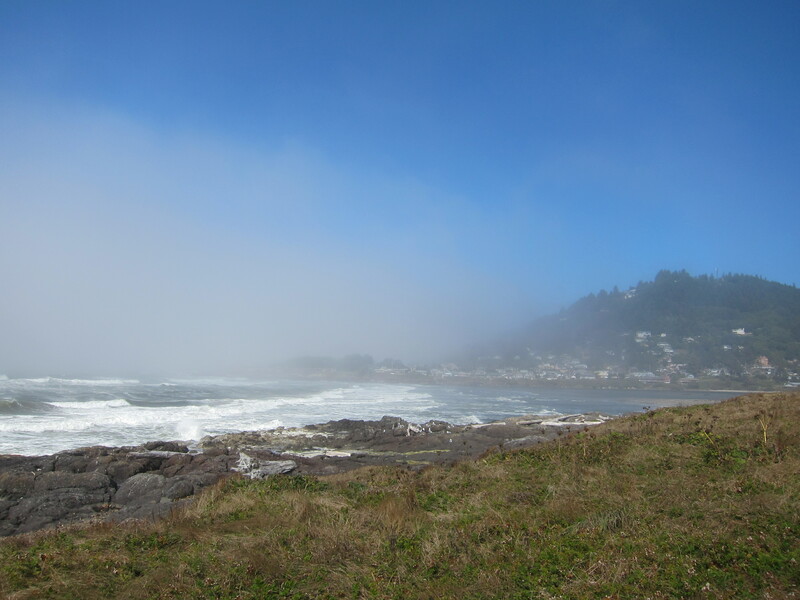 Continuing south, looking back at a barely visible Yachats. At some point I could see the fog just flowing down from the sides of the hills on the side of the road. This road is something else. Traffic was not too intense. 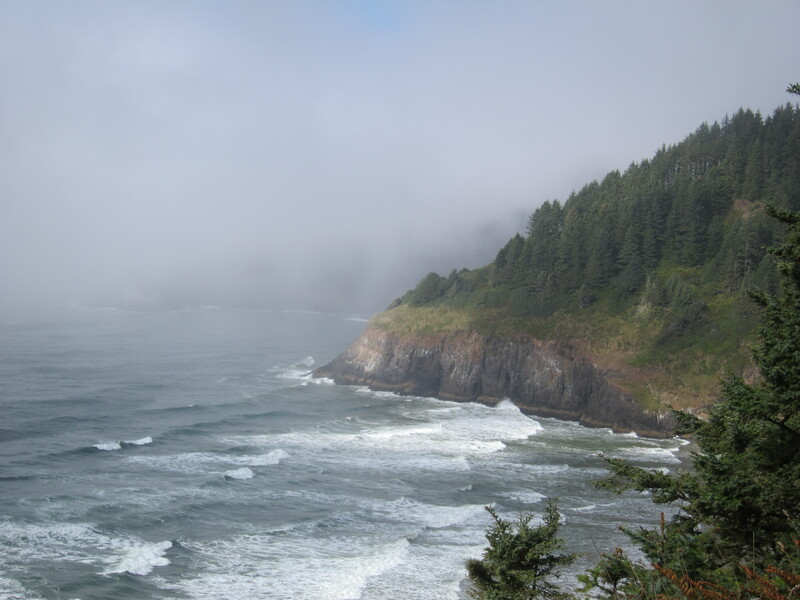 The Heceta Lighthouse is not visible. It is there, I assure you, on the left area of this photo. 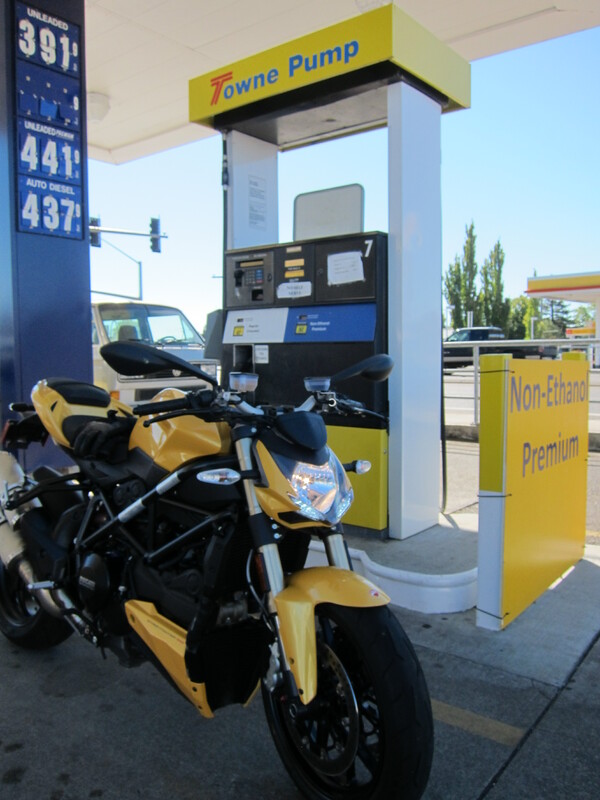 One final stop on the Low Pass gas station for another splash of non-ethanol fuel. And I was home. I have not overcome the capacity of this bike yet. There is plenty to learn from it, and I know I will never get to the point where I reach its limits anyway. It has a lot more power than what I would be capable or interested in managing at its limit. But I got to a point where I feel confident tossing it on some corners, those mid speed corners and where I can see the apex and have a clear view of the exit and follow up. 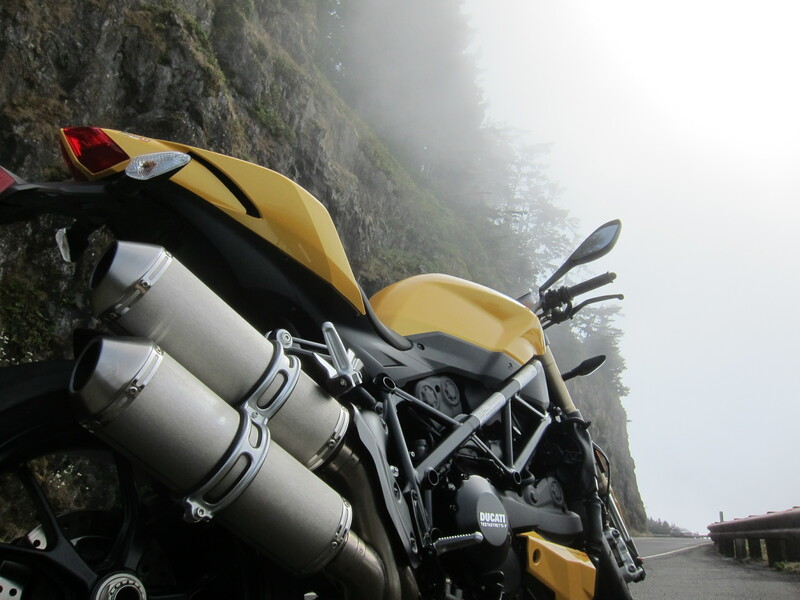 I’ve ridden several Ducati bikes (Monster 696, Monster 1100, Hyper 1100 evo, Multistrada 1200). 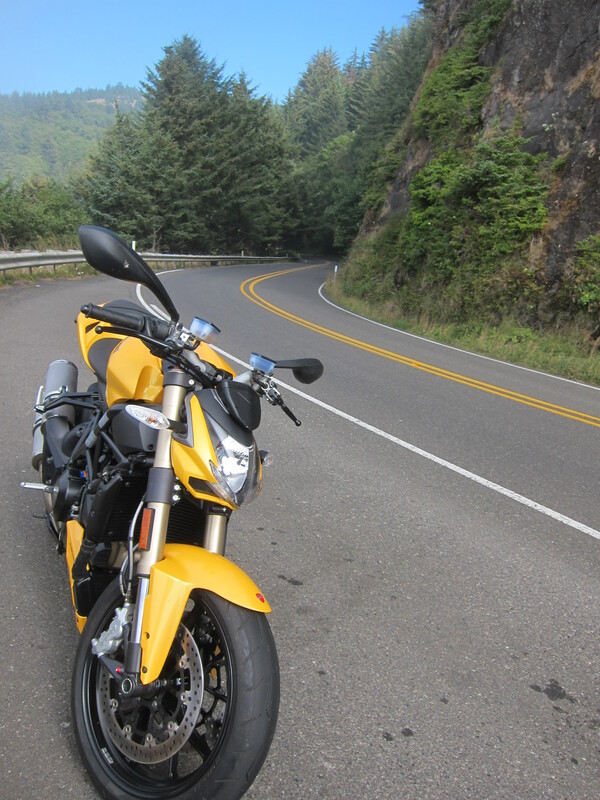 Riding the Ducati, hearing its motor run, always gave me the impression of a clean canvas with a palette of colors, and no instructions for the rider to complete the picture. 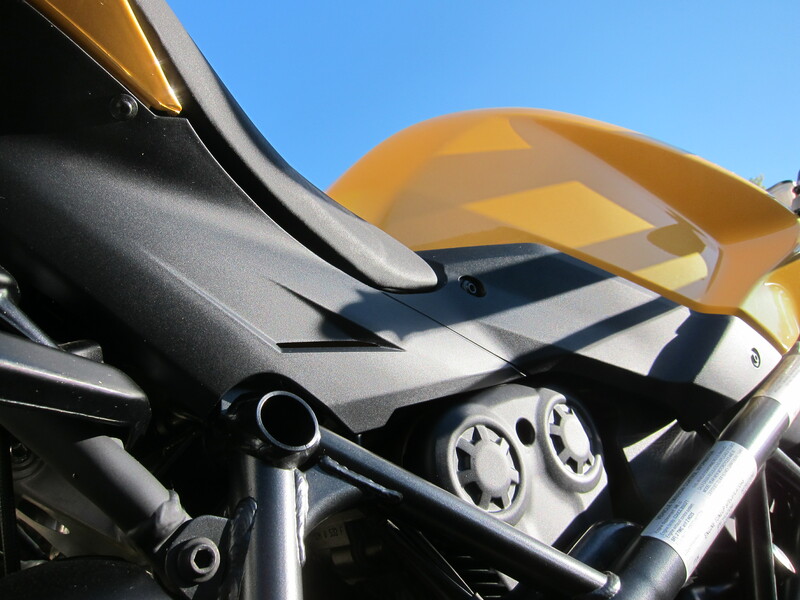 Although their design is visually finished and complete in my opinion, beautiful in its totality and in its detail, its performance requires a good level of interference from the rider. They are not “spazieren” type bikes. Even the Multistrada with its four-ride-mode system did not give me that impression of a finished product in terms of performance. They have their quirks and there is a necessary learning curve or set of skills for managing them. 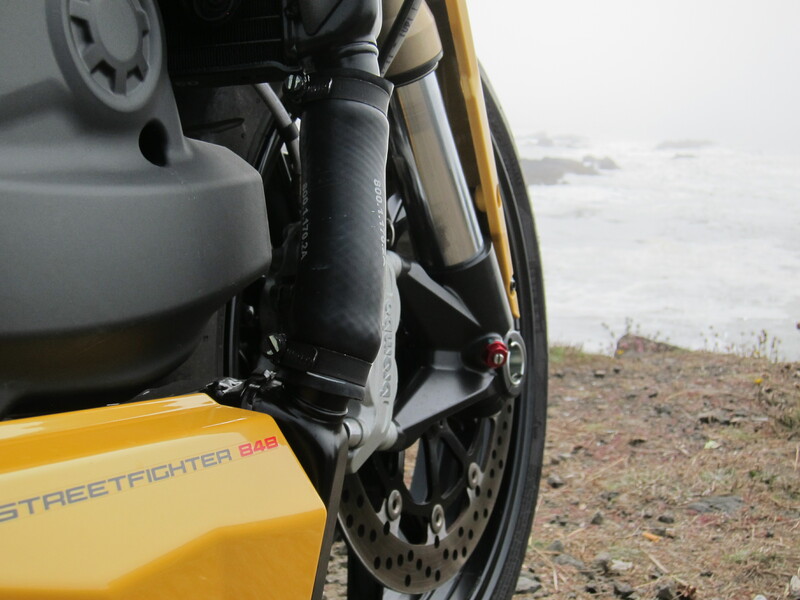 I’m particularly enjoying the 6-8k band of the torque curve for a somewhat relaxed approach to the curves on the Streetfighter 848. And the rush of power on the 7-10k band. But I use that power only very, very rarely and under special circumstances. After all, I want to ride tomorrow and the day after tomorrow. Today’s ride was 238 miles (383 km) of fun. 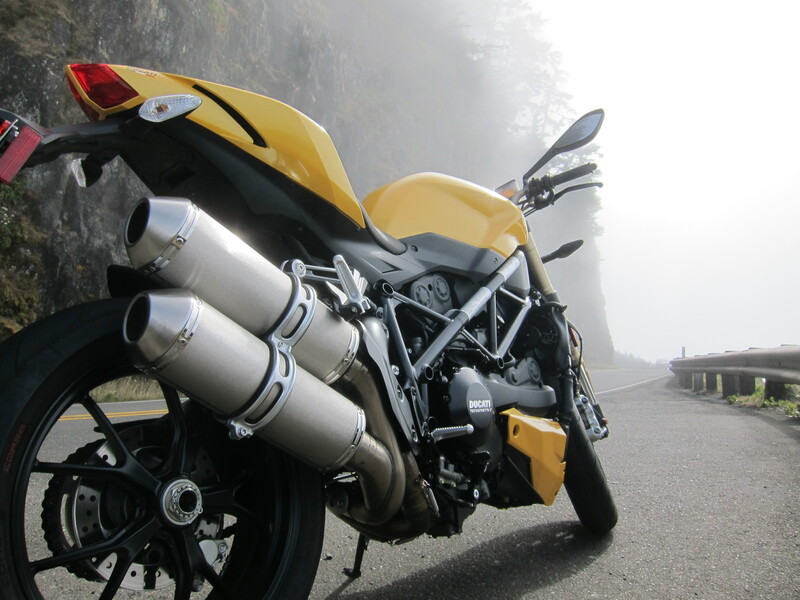 This entry was posted in Riding the Ducati and tagged Ducati, Ducati Streetfighter 848, Streetfighter 848. Bookmark the permalink. 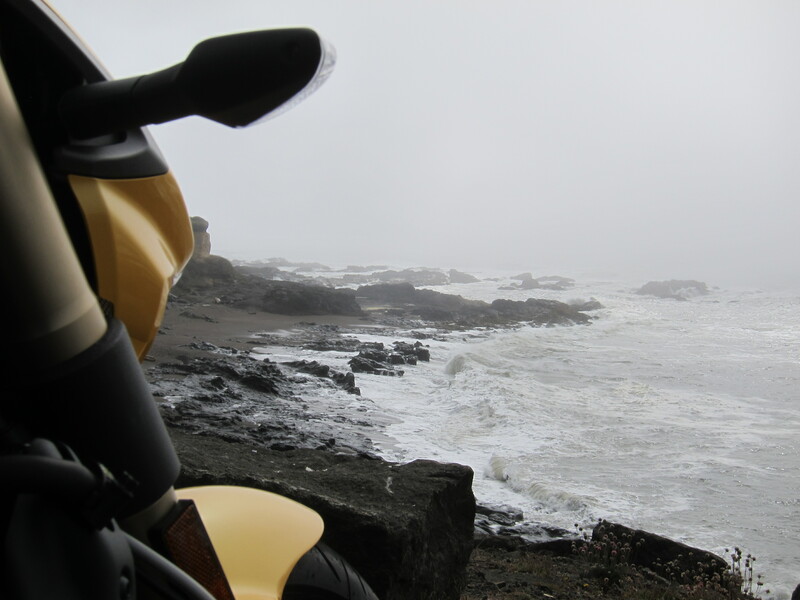 The coast looks COLD, but the Duc makes up for it. 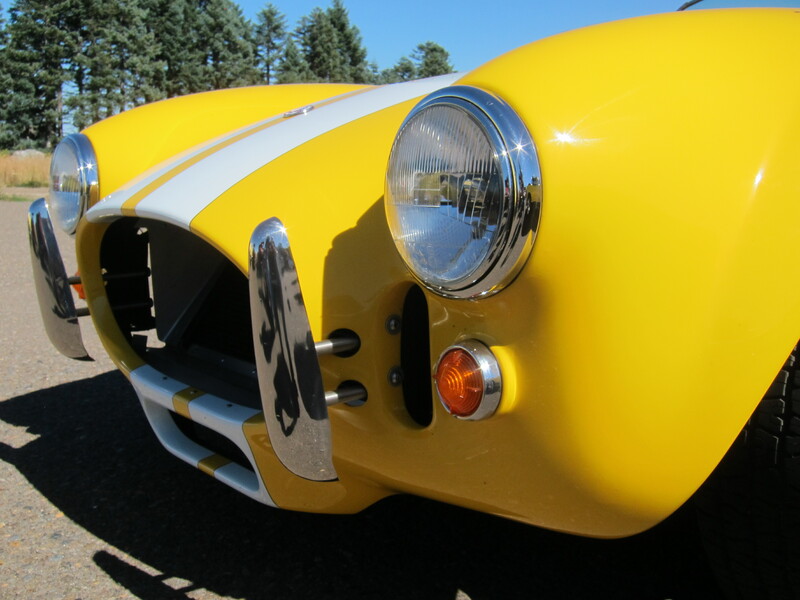 A splash of yellow contrasted with the dull grey of the fog. 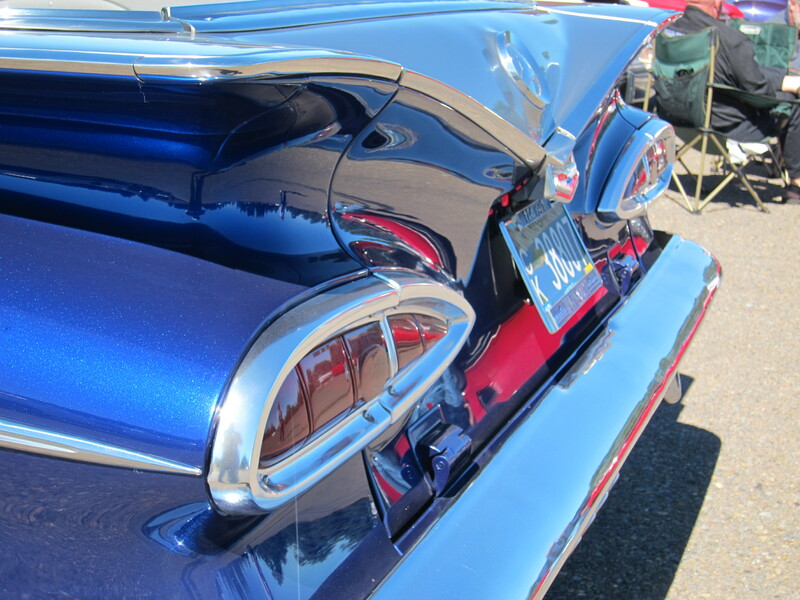 That was an interesting vintage for GM cars. 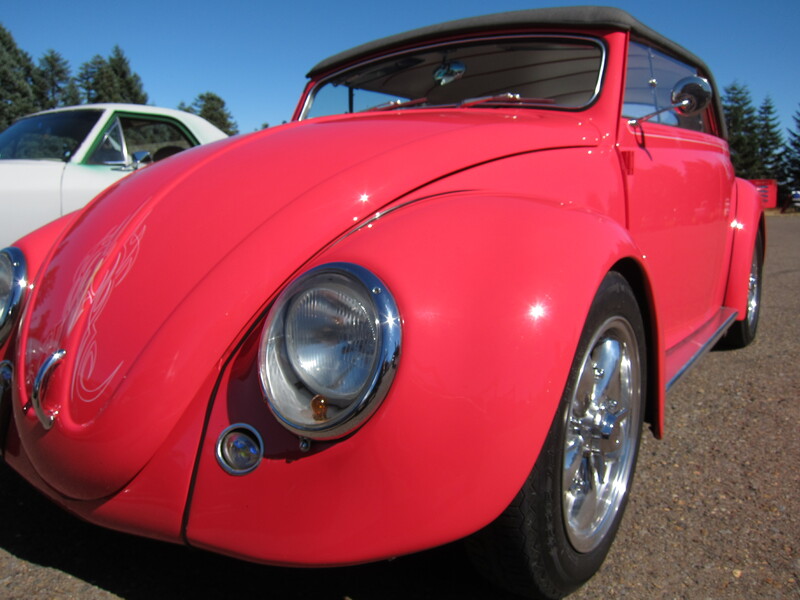 Indeed, the VW seemed like it was chopped. Beautiful pictures as always Cesar. I always feel privileged to live in such a beautiful valley. I am seeing if this comment will work replying to another comment as they haven’t been showing up as a stand alone comment. I think I might be stuck in your spam filter Cesar. It happened with Word Press every so often. Hi Trobairitz, yes, you have been on my spam folder, I found out recently. So I rescued all of your comments and replied to each of them last weekend. I had never been to that spam folder before until I took a look at it last week. Back to your comment of just now, yes, it is a privilege to live in this valley. I’ve heard of so many other towns and regions in the world where people claim they are 1-2 hours from the mountains and the ocean. Not only this is the case for Eugene (and Corvallis, for that matter), but we have the privilege of sharing a sport/hobby that allows us to experience it and hence make it especially true. 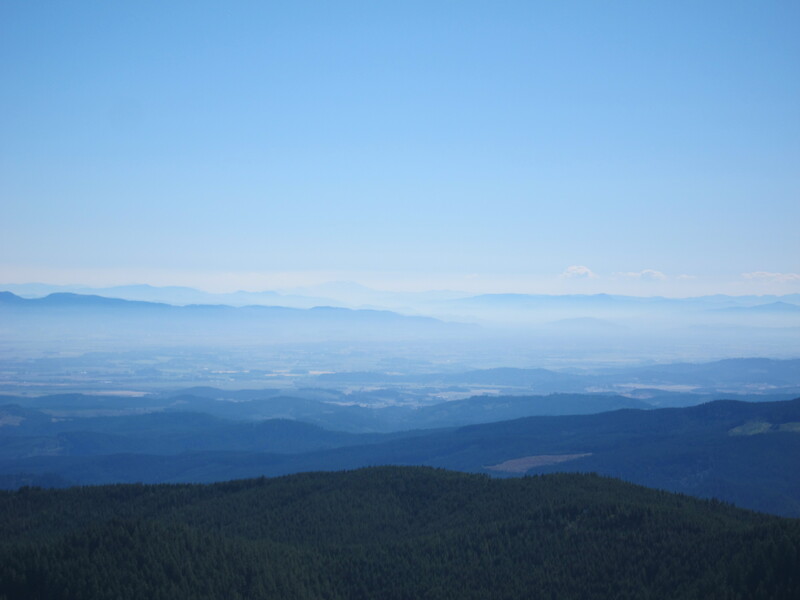 What a stark contrast in the weather from thick fog on the coast to a beautiful sunny day up top on the mountain. And there must be some teriffic riding in between. That duke would be loving those mountain passes. 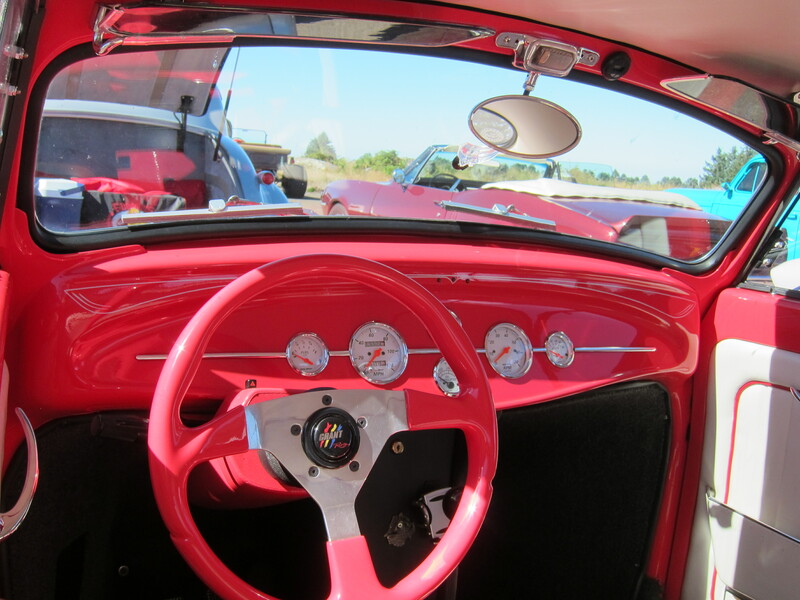 I like the interior of the pink VW. Theres been a lot of work go into that. Are there even bad places in Oregon? I should just copy and paste one of my last comments: again brilliant pics in brilliant scenery. My favourite is the second one, it adds a very nice seasonal touch. 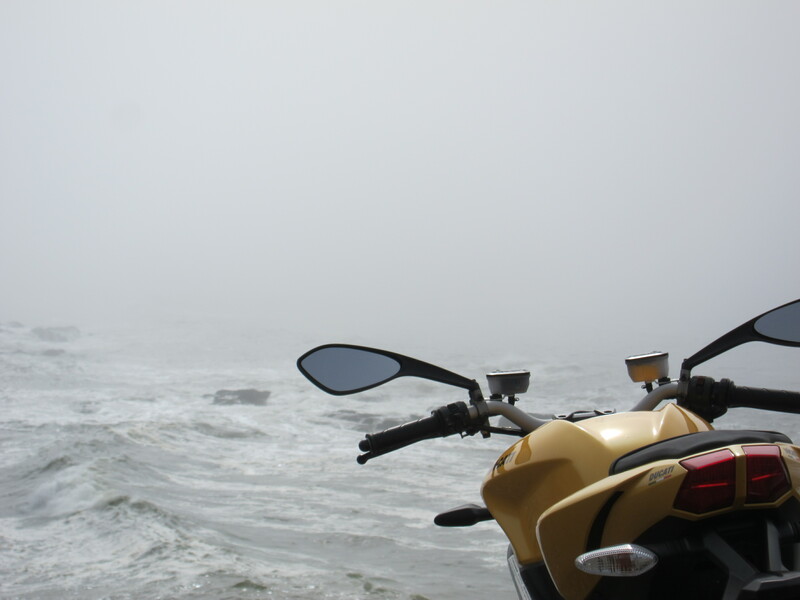 It is not like where you live is not a nice motorcycle location, right? 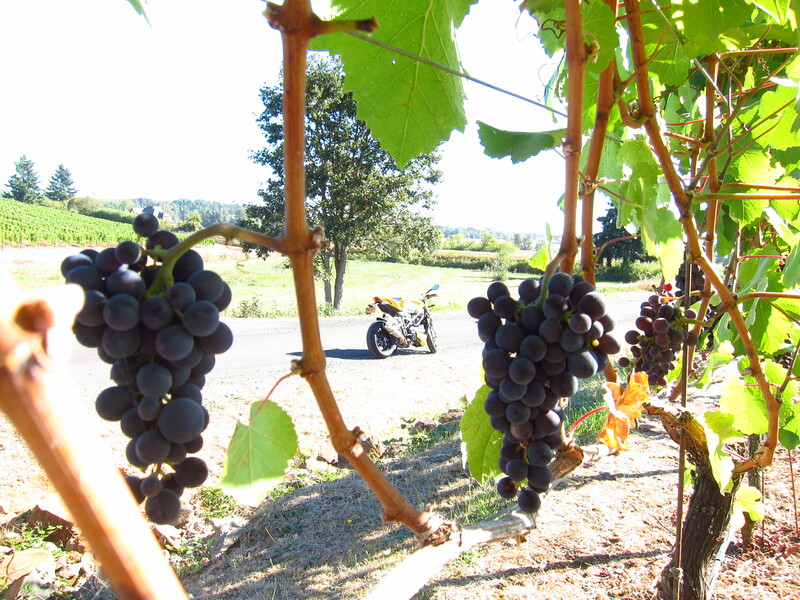 If you are talking about the picture with the grapes, with the bike on the background… that picture took some time to figure out the right light. But thanks to digital cameras, I can use the trial and error approach. I did not need to risk it not working and only finding out in the dark room. How quickly we settled into the digital format, how convenient it has become.